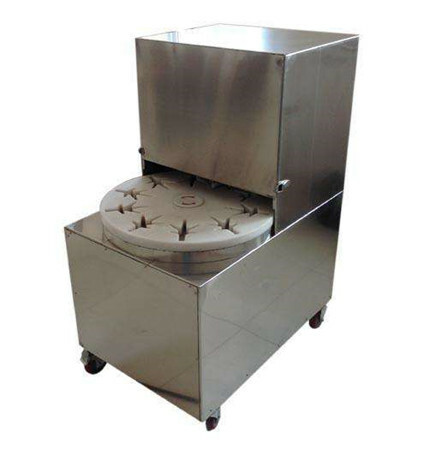 Chicken feet cutting machine is suitable for cutting chicken feet. We have two types of chicken paw cutting machine according the capacity and different working principal. Chicken feet have a high nutritious value, and are rich in calcium and collagen. Chicken feet are sold fresh in markets and produced into pickled chicken feet. Cutting chicken feet into the specified size is a key factor in production. Industrial chicken feet cutting machine has a high degree of automation, high production efficiency, good cutting effect. It is operated very safely, easy to maintain and operate. It also can cut other meat products. The whole machine is made of stainless steel, high quality and more durable, long service life, low noise. 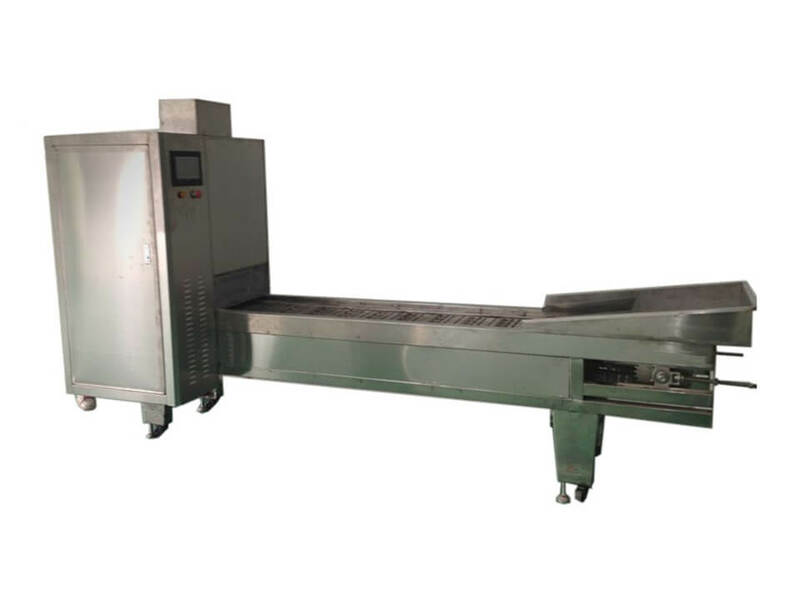 Industrial chicken paw cutting machine includes two parts, conveyor part and cutting part. As its high automation, it can save lots of labor and time. 2. Transmission system is equipped with high quality gear motor, driving with low noise. 3. Feeding plate and punching parts move relatively by mechanical linkage structure, which makes transmission stability without error. 4. The contact parts of material and machine are in line with national food hygiene standards. Small chicken feet cutter machine adopts cavity type feeding device which has no damage to the claw. It adopts the molding cutter, cutting accuracy, neatly, without adhesion, and producing no bone chips. Gear motor is made of high quality and has little noise. Feeding turntable is working through splitting precision transmission device accurate without error. Feeding plate and punching parts move relatively by mechanical interlocking mechanism, driving permanent and stability without error. The contact parts of material and machine are made in accordance with national food hygiene and keep the products clean. 1. Used for cutting chicken feet into small size. 2. Adopting cavity feeding device with no damage to the claw. 3. Equipped with molding cutter, cutting accurately and smooth, without bone chips. 5. Contact parts are made of food grade stainless steel material, in line with national food hygiene and healthy. Chicken feet processing machine is mainly used in pickled chicken feet industry and chicken feet production factory. 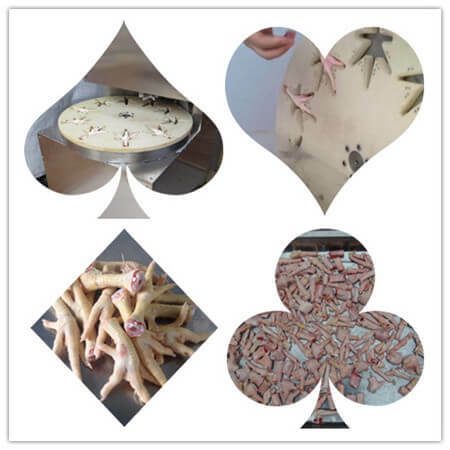 In America and the UK, chicken feet export is a particular profitable trade to Asian countries. Chicken feet enjoy a good market in Asia. They are sold in big markets or produced into pickled chicken feet, a popular snack food. 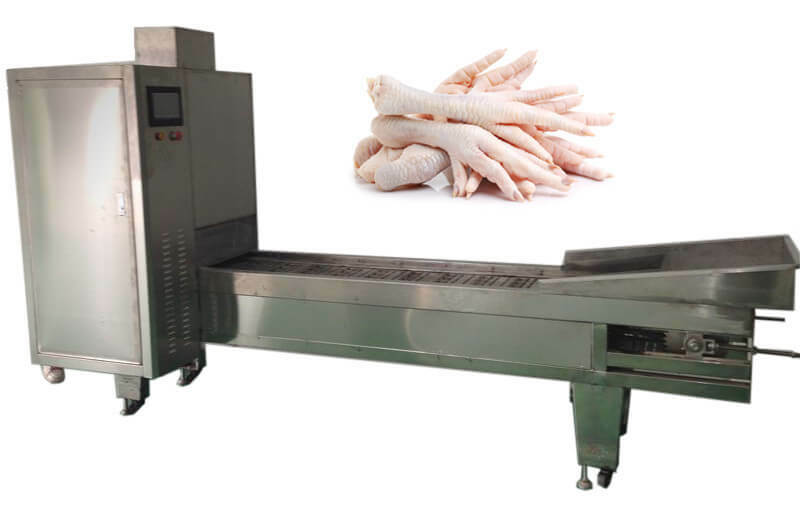 In order to be sold in markets, chicken feet need to be cut into needed size with chicken feet cutting machine. Before making pickled chicken feet, it is important to cut chicken feet into small size which is easy to production process and packing. Chicken paw cutting machine is quite important in these industries.